Elko, Nevada and Bozeman, Montana: The 20th annual National Cowboy Poetry Gathering held each year in Elko, Nevada saw and heard some new twists on song and poetry this year from a group of five Mongolian tradtional performers. The haunting sounds of "horse-headed fiddle" and throat singing mixed with the more familiar twang of the guitar and fiddle and the dropped g's and drawl of Cowboy Poetry. The Mongolians impressed not only with their music but with their colorful national dress, their culinary skills and their epic poetry. They also caught on fast to traditional American Cowboy fun like dancing and drinking. The January 24-31, 2004 event was the culmination of 5 longs years of work begun by Linda Svendsen of Boojum Expeditions and Charlie Seeman, Western Folklife Center Executive Director. 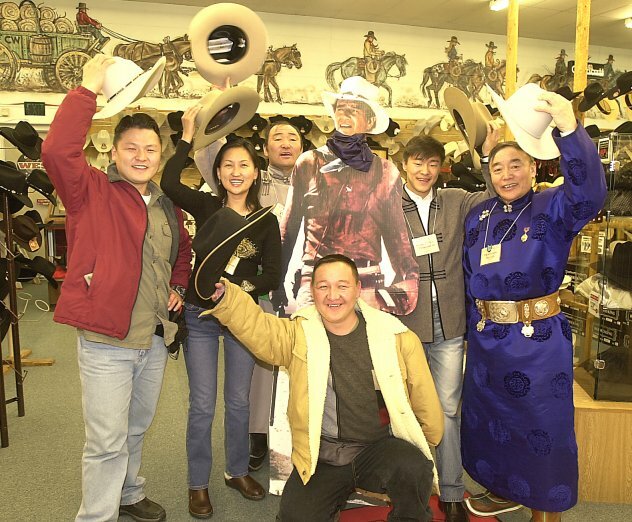 Linda, a regular at the Gathering, hatched a plan with Charlie and others to do a survey trip to Mongolia in 2001 to meet prospective Mongolian cowboys. That led to the Western Folklife Center finding grant money to bring the performers this year to Elko. Making the link between cowboys around the world is an important part of the Elko celebration, which in its 20 years has invited cowboys from various other countries to participate and share their love of horses, livestock and wide open spaces.